Our Regional BuZZ steps aside this week for a new feature “Product Update” with Frank Jonen where Frank takes an in depth look at a less-than-common tool and explains it in six minutes or less. This week, cineSync remote viewing and then on to our “Pick our Brains” segment where we solve listener’s technical and creative questions. After the break, we’ll be on the phone with Kevin Cloninger, President of SophiArte, a production company aiming to change the concept of “Art Film” and make films that promote well being. And finally, in our "BuZZ in Depth" segment we’ll be talking about 10 years of Flash. We’ll start off with Jay Rosenberg, Author of Adobe Premiere Pro 2.0 Studio Techniques and current member of the Adobe Premiere development team and a former independent filmmaker who has directed broadcast commercials, music video and short films. Jacob is teaches Adobe Premiere Pro, and the other Adobe products, from IBC to NAB and gives a real-world perspective on editing with Premiere Pro. Our Regional BuZZ steps aside this week for a double dose of our "Pick our Brains" segment where we solve listener’s technical and creative questions. After the break, we’ll be on the phone with Music Video Director, Tony Petrossian from Rockhard Films. Tony’s videos stand our from the pack on MTV and include hits like Avenged Sevenfold’s Beast and the Harlot and Automatica’s Graduation Day. Where appropriate, Tony is a master of visual effects, and we”ll be talking with him about his approach to concepts and how some of the effects have been done, particularly those in Stone Sour’s Through Glass. And finally, in our "BuZZ in Depth" segment we’ll be talking Digital Asset Management – what it is and what choices are there. Our Regional BuZZ steps aside this week for a new monthly segment “Insider’s Guide to Distribution” with Stacey Parks. Stacey is a former foreign sales agent and current sales executive at the BBC in Los Angeles, ?Insiders Guide to Distribution? will tell you how with a few little-known distribution secrets you can take control of your filmmaking career. Not only will your work gain audience recognition worldwide, but you will be able to sell your films for a profit and make a real career out of filmmaking. After the Insider’s Guide to Distribution we’ll be handling listener’s questions in Pick our Brains. After the break, we’ll be on the phone with Robert Liano, Producer and Co-director of A Broad Way, an ambition attempt to document the full length of Broadway (Manhattan, NY) with the help of five professional crew shooting with Panasonic Varicam and DVCPRO 50 and 220 Amateur shooters who took care of one block each. And finally, in our "BuZZ in Depth" segment we’ll take a archiving, backup and Blu-ray. 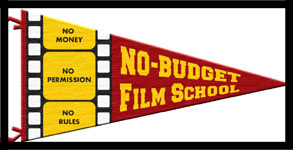 The No Budget Film School will be presenting their next "Art and Science of No-Budget Filmmaking" course on October 21 and 22. They have announced that attendees will receive free copies of Axium Scheduling and Axium Budgeting software free – a regular value of US$400. The two day immersive class will reveal the secrets of micro-budget filmmaking (from $0 to $250,000). NBFS founder and instructor Mark Stolaroff, an independent film producer and former principal of Next Wave Films, will be joined by several special guest speakers, including Paradigm Consulting President Peter Broderick (former president, Next Wave Films); 2929 Productions’ Senior Vice President Mike Upton; PlasterCity Digital Post Director of Operations Michael Cioni; and Ron Judkins, two-time Oscar” winner for Sound (“Saving Private Ryan,” “Jurassic Park”; director, “The Hi-Line”). Creative Planet’s Digital Production BuZZ podcast interviewed Mark Stolaroff on its June 16, 2005 show and Peter Brodkerick on the June 9 show in 2005. In the NBFS course, students learn the practical rules of micro-budget production that can be applied whether the budget is $2,000 or $200,000. The class is designed for filmmakers who are ready to start producing a feature, no matter how much money is raised. NBFS is practical, rather than anecdotal, allowing filmmakers to apply the tools immediately to their upcoming projects, saving time and money, as well as preventing costly and sometimes fatal mistakes. In the course students are guided line-by-line through a budget and taught where and how to spend money, and more importantly, where not to spend money. Most importantly, students will be taught where to prioritize their very limited resources, learning that qualities like good acting, strong storytelling, and uniqueness are far more important than elements like format resolution. We’ll start off in Australia with John Dickinson, a broadcast Motion Graphic Designer for Foxtel there, a well know After Effects, Pro Animator and Invigorator trainer and the creator of the Expert Training Series available through toolfarm.com. John will be talking about the process of Motion Graphic Design – how he goes about taking a brief and turning it into a finished piece. Our Regional BuZZ is from Scottsdale Arizona, where Bill Davis will be talking about the Scottsdale/Phoenix production scene and his Edit Now series, followed by our Pick our Brains spot where we answer listener questions. After the break, we’ll be talking with Samuli Torssonen – Creator/Producer of the Star Wreck series and Timo Vuorensola the Director Star Wrek – In the Pirkinning movie. Star Wreck – In the Pirkinning is the most popular Finnish movie, having been downloaded over 4 million times and been shown twice on Finnish TV, and yet it was made in the creator’s apartment using green screen and 3D rendering. And finally, in our "BuZZ in Depth" segment we’ll take a look at Apple’s announcements at the WWDC and what they might mean for Digital Post Production and Final Cut Studio Users and a mention of Second Life for collaborative filmmaking. We’ll start off with our roving reporter, Ross Jones, live at University Film and Video Association 2006 Conference at Chapman University to talk “Storytelling in the Digital Age” with Dom Cicchetti – Panasonic Business Development Manager Education; Fred Ginsburg, Ph.D. – President Equipment Emporium and Bill Hanson – Apple Computer. Our Regional BuZZ is from Newcastle, Australia where Kristi Street, an organizing Director of The Big Shootout video competition will be talking about Extreme Filmmaking, followed by our Pick our Brains spot where we answer listener questions. After the break, we’ll be talking with Richard Harrington about a new book he worked on After Effects @ Work that presents a creative array of real-world projects that artists worked on with a budget of $10,000 or less.